NOCOLOK® flux and brazing pastes offer numerous advantages that distinguish them from other products. Depending on requirements, the pastes can be produced in a wide viscosity range and with different solids contents. The resulting emissions are thus removed in good time before the brazing process by appropriate channelling of the waste gases. Therefore, the actual brazing process is not affected. At just under 200 °C, the organic solvent have decomposed without residue. 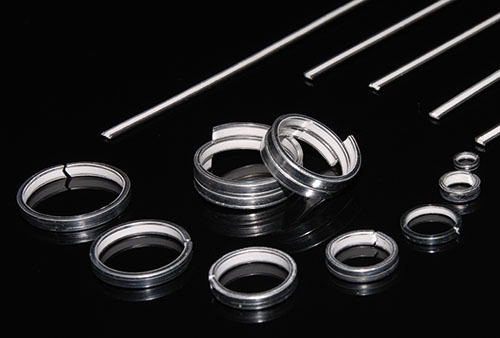 Flux Pastes are mainly used inside B-tubes and folded tubes, in order to provide a line of flux on a cladded surface. These paste formulations are available in FG (fine grade) version, the N version (“new” – i.e. with adjusted rheology and re-mixing characteristics) and UV version (ultraviolet sensitive pigments for special application monitoring). Metalized Flux Pastes (Brazing Pastes) are often used manifolds/tubes or blocks/manifolds or header/tubes or in any place there is need for joint formation with additional filler metal (usually used to compensate for challenging design situations or for larger tollerances on stamped parts). Ultra Flux Paste is used inside B-tubes and folded tubes, in order to provide a line of flux on a cladded surface (more “sticky” than glycol family “028”). 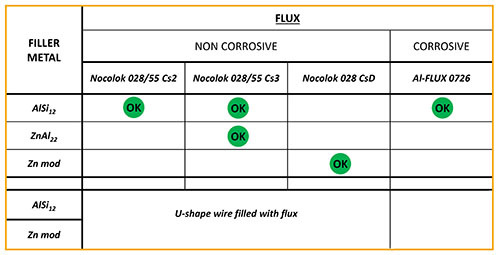 NOCOLOK® flux and brazing pastes command a maximum variety of options in flux and brazing alloy powder applications. Consequently, NOCOLOK® flux pastes can be individually adapted according to respective technical requirements and the brazing processes used. The grain size of the brazing powder can be adapted to all corresponding applications. Flux and braze pastes exhibit pseudoplastic viscosity, meaning to have shear thinning behavior. 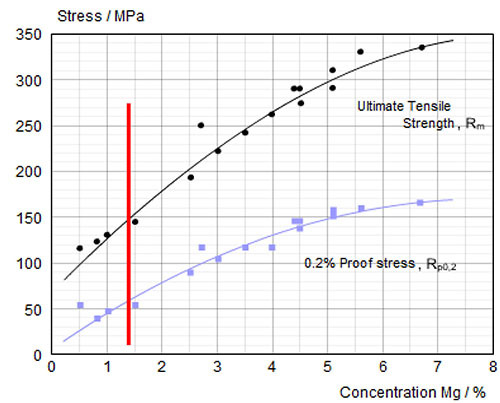 As the shear stress is increased, the viscosity decreases, but the relationship is not linear. When the shear stress decreases, the viscosity increases, again non-linearly. 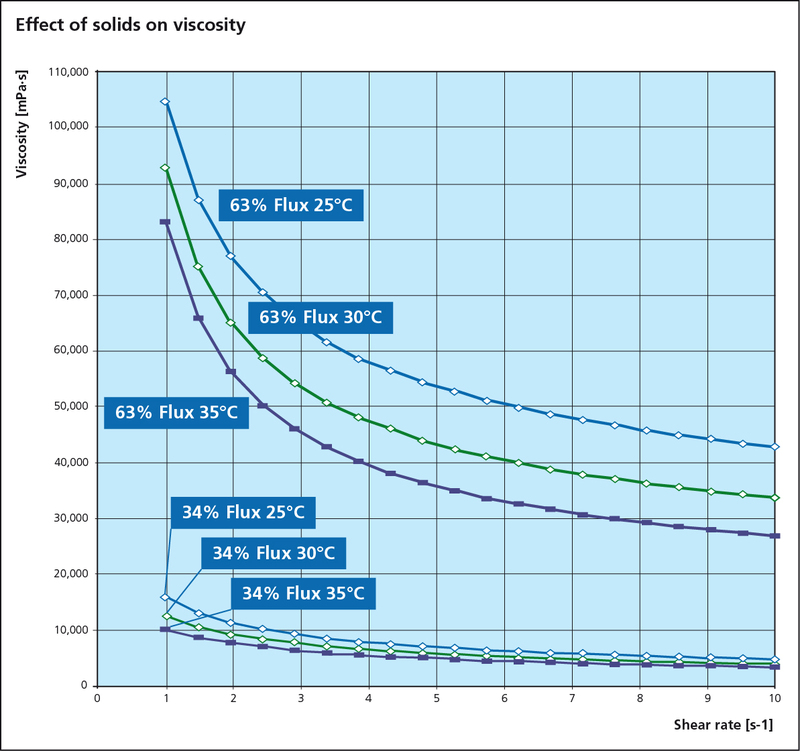 Other factors affecting viscosity are solids content and temperature. Generally speaking, as the temperature increases, the viscosity decreases. 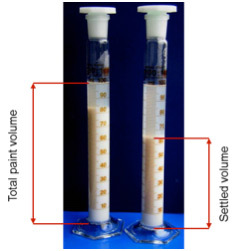 Conversely, as the solids content increases, the viscosity also increases. These dependences illustrate the importance of quoting the parameters under which the viscosity is measured. 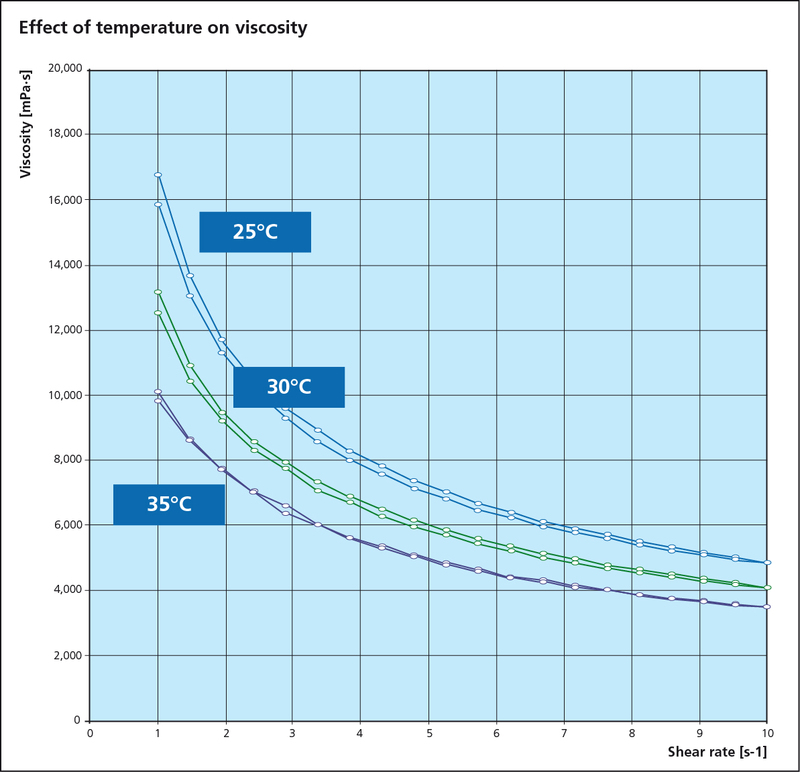 Note that at each temperature, a double curve is shown representing two sets of measurements: one curve shows the decrease in viscosity as the shear rate is increased and the other curve shows the increase in viscosity as the shear rate is decreased. This mirrored behavior as the shear rate is increased or decreased perfectly illustrates the pseudoplastic behavior. These properties allow a bead of flux paste to be dispensed on the surface of a folded tube consistently and continuously at line speeds ranging from 30 m/min to 120 m/min. Since the carrier is a main ingredient, the carrier burn off temperature must be considered. When designing a flux delivery system, choosing the right delivery pump is just as important. Below is a list of pros and cons for the associated pumps. Rotor-stator pumps are the pumps of choice because of their ability to deliver a constant volume of material without pulsation over a range of flow rates. 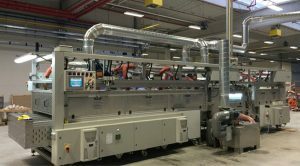 The best example of this is in the localized dispensing of a continuous bead/stripe in folded tube mills where speeds can range from 20 m/min to 120 m/min. In lower demanding applications where precision dispensing and flow control is not so critical, for example in tube to header fluxing, the lower cost options (air over liquid, diaphragm pumps) are more than adequate. In addition to the standard methods of applying flux to heat exchanger components (wet fluxing and dry fluxing), there is an increasing trend to using sophisticated flux formulations for selective pre-fluxing of components and/or localized fluxing of complicated geometries. The driving force behind this trend is multi-faceted: heat exchanger manufacturers are seeking to out-source flux application, to partially or completely eliminate certain process elements (fluxer, degreaser) and the movement away from seam-welded and extruded tubes to folded tube technology. Flux Paint: Mixture of various powders mixed with a binder which is applied to as substrate in a thin layer. The coating is then converted to a solid film during a subsequent drying (curing) operation thereby adhering to the substrate. Paste: Any mixture of various powders mixed with a carrier. Generally used for application where flux and/or alloy is required for a target location on a heat exchanger assembly or component. The viscosity is adapted to fit the application. Binder: Complex organic compounds that upon curing, reacts to provide adhesion of flux particles to the coated surface. Additives: Organic or inorganic substances used to modify the rheological properties of a fluid. Curing: Drying of the flux painted parts usually with hot air (150°C). Liquid carrier, i.e., water and/or organic solvent(s) evaporate and the binder reacts to provide adhesion. Adhesion: Qualitative or quantitative measure by which bonding strength of the flux particles to the coated surface is determined. De-binding: Process of binder removal from the painted surface either in air or in the furnace atmosphere by the treatment with high temperature. Viscosity: a measure of resistance to gradual deformation by shear stress, corresponding to the informal concept of thickness. 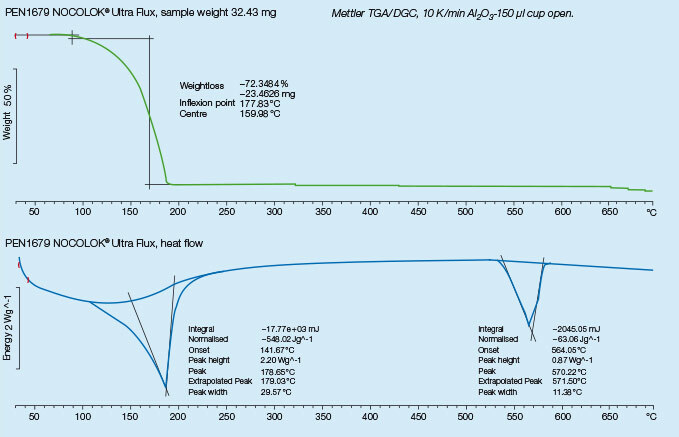 Thermogravimetric Analysis (TGA): A technique in which the mass of a substance is monitored as a function of temperature or time as the sample specimen is subjected to a controlled temperature program in a controlled atmosphere. Viscosity is an essential parameter for the paint flux and is used to determine a suitable application process. 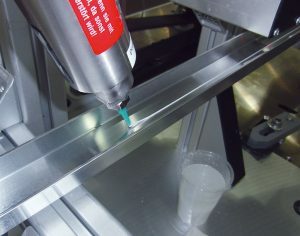 A change in viscosity usually requires a change in the design of the application technique or equipment. All paste and paints used in fluxing are non-Newtonian fluids, meaning that the correlation between the applied shear stress and the shear rate is not linear. Many liquids, including paints are typical shear thinning fluids whose viscosities decreases non-linearly with shear stress. 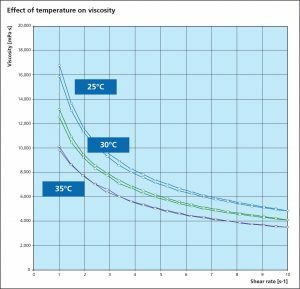 When providing a viscosity value, the methodology, specific shear rate and temperature must be provided. Note that the higher value of the settled volume at left means a slower process of settling. The settling rate can be affected by several parameters such as binder concentration, flux solids content, storage time and temperature. To ensure complete homogeneity prior to use, a thorough remixing is necessary. Just shaking the container is usually not sufficient. It is recommended to use of a gyroscopic mixer which rotates the container around two perpendicular axes resulting in intensive material flow. 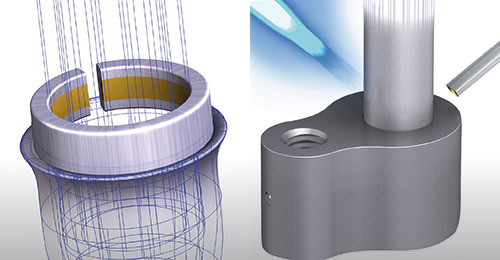 These shear forces ensure optimal mixing without affecting the structure of the material. The degree of paint flux adhesion varies depending on the heat exchanger manufacturer’s requirements. If paint fluxing is performed off-site and the material needs to be transported over long distances, a higher degree of adhesion is required than if the material is coated in house and simply needs to be transported from one station to the next. The degree of adhesion is typically controlled by the binder concentration in the formulation. While there are standard methods for measuring adhesion (ASTM D 3359 Standard Methods for Measuring Adhesion by Tape Test), some paint flux users have developed their own in-house methods. The advantage of employing standard methods for measuring adhesion allows for a higher degree of inter-laboratory precision and comparison. For successful brazing of paint fluxed aluminum components, the binder must be removed before reaching brazing temperature. In the production process, the paint flux carrier is removed immediately after coating in the dry-off / curing operation. When paint fluxed components are put into the brazing line, the increasing temperature is then responsible for decomposing and removing the binder by evaporation. The temperature range at which the binder is removed is determined by Thermogravimetric Analysis (TGA). With this technique, a simulated braze cycle is used to determine at which temperature the binder is removed. The TGA curves below shows the de-binding temperature for a typical paint flux formulation. 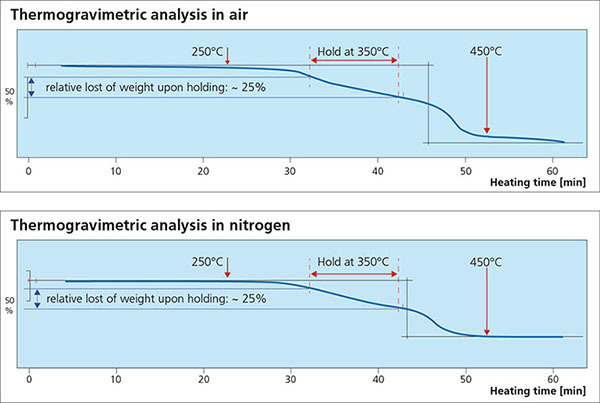 Note that whether in air or nitrogen, the binder removal temperature is in the range of 250°C to 450°C. This means that in this case, at least part of the binder will be removed in the brazing furnace. In continuous tunnel furnaces, this is not an issue since the binder evaporation products will be swept away by the counter flow of nitrogen. In semi-continuous or batch type furnaces, the potential influence of binder removal on equipment must be individually considered depending on each brazing line design. In most semi-continuous or batch type furnaces, binder removal takes place during the drying or preheating step in the presence of air – at temperatures below 400°C (to avoid formation of high-temperature oxides). Special consideration must be given to paint fluxed components which are not boldly exposed to the furnace atmosphere. These areas are usually enclosed spaces such as inside manifolds, sandwiched evaporator plates and turbulators for charge air coolers. In these cases, de-binding products may remain trapped in the enclosed spaces and result in discoloration and black carbon residue deposits. In these cases, it may better to sacrifice some adhesion (lower binder concentration) in order to ensure adequate binder removal.